Squarespace is a website builder that positions itself as an all-in-one platform to create personal and eCommerce websites. It allows building small-to-medium online stores, which look nice and feature decent performance. The website builder is a great solution for entrepreneurs, who wish to present their products in the most favorable light, attracting user attention and engaging them into the shopping process. The usability of the service is one of its most crucial aspects, while the functionality of the platform does not lag behind as well. So, how good is Squarespace, when it comes to eCommerce website creation? Can it be a decent competitor to other renowned systems? We have reviewed some of the most appealing Squarespace eCommerce examples to enlist their major features and advantages. This will give you the idea of the platform’s implications and eCommerce functionality. 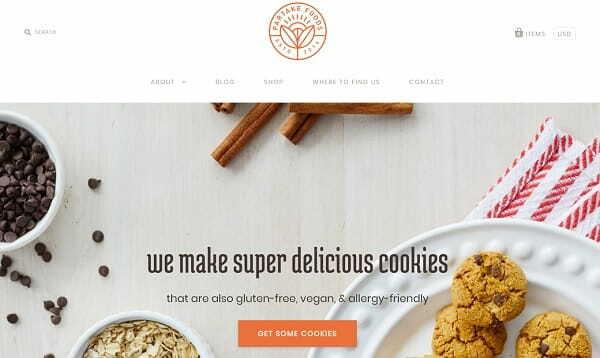 Partakefoods.com is a website, which offers allergy-friendly and healthy snacks for everyone, who suffers from food allergies yet looks for tasty and safe products to consume every day. The website comes with the online store, which is logically-structured and offers a rich assortment of products both for people, who have eating restrictions and for those, who just wish to eat healthy foods. One of the first things that catches user attention is large photos of products that are real and help form the idea of how they actually look. Each product comes with detailed descriptions and specification of ingredients it is cooked of. This is what most website users initially pay attention to prior to placing an order. It’s possible to make a one-time purchase of each product as well as to order a subscription to save the money. During the shopping process, you can specify the size and quantity of items you need. A convenient review feature allows reading the posts of previous customers, who wish to share their shopping experience. Currency choice is also available here (you can select either USD or CAD). To stay informed about Partake updates, news and coupons, you can subscribe to the newsletter, which is another merit of the website. Crozetcoffee.com is the top notch destination for coffee fans, who give preference to unique and quality coffee brands only. 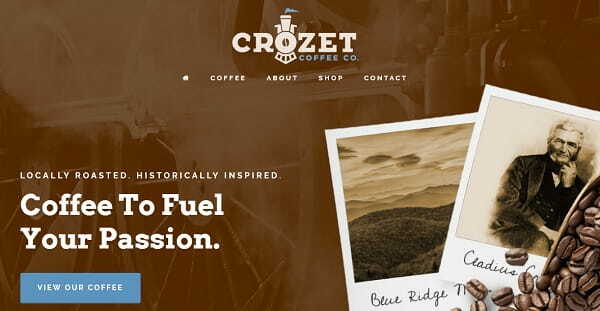 Crozet is a renowned coffee brand with rich history and exceptional coffee roasting and brewing methodology. The web store available at the website presents original Crozet coffee sorts displayed in the show window. However, it’s quite complicated to call the product range extensive. There are only three coffee sorts offered for sale here by now. The photos of products look realistic and appealing. Prior to placing an order, you should choose the roast you prefer, check whether it is in stock and look through the detailed product descriptions. It’s possible to specify the amount of coffee packs you wish to get. Real Crozet fans may additionally order a brand T-shirt in the separate web store section. Customer Reviews feature is also realized here so that everyone could write a few lines to share the impressions of the purchase made. The web store is pretty simple, but the products it offers for sale are described to the advantage here. 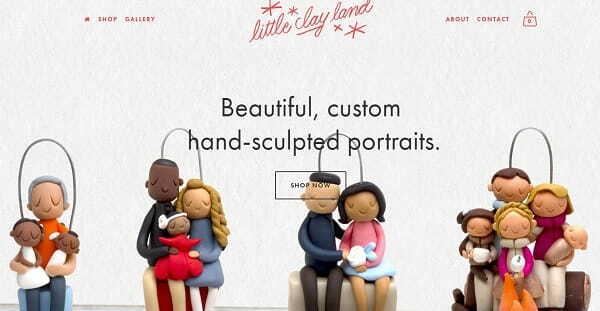 Littleclayland.com is a place, where you can shop for amazing custom hand-sculpted clay portraits, miniatures and figures made by Laura. As you access the web store, you get an opportunity to choose between three shopping options, namely Custom Portraits, Gift Cards and Nativities. Each category comes with bright original photos of works created by Laura, the author and the master. There are also detailed instructions on how to place an order, what steps to undergo to do that and how to find out the price of the purchase. The latter depends upon multiple parameters, which are also enlisted in the order section. The author describes shipping information in details, variety of options and the time it takes to receive an order. If there are still any questions left, you can send an email to the master to clear everything out. A real highlight of the web store is the “Behind the Scene” section, which makes it possible to see the work on the clay figures creation in progress. That gives a powerful urge to place an order! 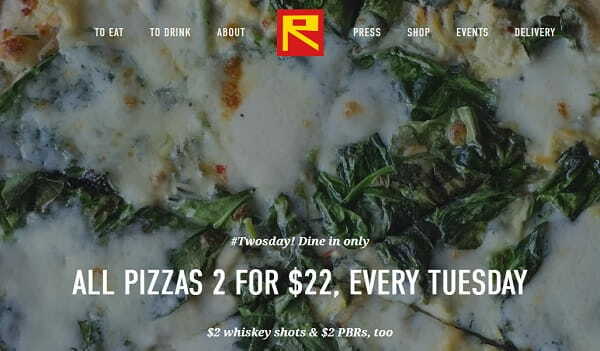 Renochicago.com is a website of a casual place in Logan Square, where everyone can have meals and spend good time in the circle of friends. The shop section of the website presents a list of brand products, which enjoy popularity with visitors and fans of the place. These are mostly clothes for kids and adults, coffee and other accessories here. The list, however, is not long and consists of a few items only. Each product offered for sale comes with concise descriptions, price specification as well as size/quantity parameters. This makes the shopping process simple and quick. As you browse the web store, however, you get the impression that it is incomplete and requires improvement or regular updates. There are too little products here, while their descriptions leave much to be desired as well. When you get to Alexandragrecco.com for the first time, you immediately get inspired by the amazing bridal line and classic dress collections designed by Alexandra Grecco. Each collection is unique in its own way as Alexandra has a clear vision of brides’ preferences. The Shop Section comes with the drop-down menu, enlisting the main product categories and order details. These are Bridal Accessories, RTW Classics, Limited Edition, Bridal Sample Sale and Shop Policies. Whatever category you visit and whatever product you choose, you’ll be offered its detailed characteristics and several photos to get an idea of how a certain dress or accessory looks in reality. The photos are of high quality and provide a detailed view of each item. The web store as well as the entire website feature a gentle and light colour scheme, which adheres to the website theme. It creates positive impression upon first-time visitors, who come across the website looking for the best deal. Shop.ryanputn.am – the website was created by Ryan Putnam, who – not surprisingly – is a designer, illustrator and a potter. The first thought you have on your mind when you go to the website is “Huh, simple”, but the main idea is to focus on the products and works. Due to that simplicity you’re not distracted by anything, be it banners with annoying ads or bright colors. The website’s main color scheme is white & blue, and because Ryan is a designer his website is sticking to everyone’s memory. Everything is quite custom starting from the favicon and ending with the products for sale. Through the website, Ryan is offering his graphic design expertise to businesses and individuals. The shop with his works and an easily operated cart system are the basis of the website, but there is also an About page where you can learn a bit about the person behind the website, find a brief FAQ, a contact form, the possibility to subscribe to the latest updates and news, and follow Ryan on social media. The design is extremely simple, but that’s what makes it beautiful. 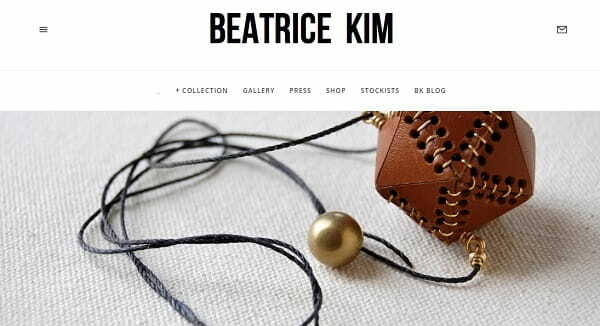 Next up is a website beatricekim.com created by yet another artist. In this case, rather than digital art, she creates jewelry. Beatrice Kim’s jewelry has been noted as a pioneer of the “handmade renaissance” by The Boston Globe’s. That’s quite a characteristic I should say, but what about her website? Well, I love the creative use of the slider, it gives the website a modern look from the start.. Every section has a bunch of beautiful images presenting Kim’s hand-made jewelry. There is no better way to describe the creative work you want to sell then to show it. The visual appeal is an important aspect of any artist’s website, and Kim uses this to her advantage. The ultimate style of the website is minimalism. You won’t find much text on the site, nor will you see loud colors. Everything is in its place from the contact form to social media buttons, from the press reviews to Kim’s personal blog. The menu though, is a little bit illogical, I think it could be simpler and more accessible. But anyway, the website is still a great sample. Thinkcoffee.com is designed not only as a shop to buy high quality coffee online, but also as a place to learn more about coffee production. In particular, the website effectively uses the following Squarespace features: a newsletter sign-up form, blog, and shop. It’s good to have job opportunities and contact us buttons attached to the bottom of the page, no matter whether you scroll up or down. Their custom favicon is very easy to memorize, which is good. By incorporating pictures of countries where the coffee varieties they sell come from, you get a good sense of geographical diversity and assortment, and finding info on their company’s impact as well as using the website’s search bar is right in the reach. While there are a lot of things that can be learned from Think Coffee’s website, there’s also some room for improvement. I wish they used photos of higher quality and it’ll be good to actually have illustrations to some articles. For example, in their travel journal section, which looks poor and empty with excessive amount of text, it’s very hard to understand the information, despite the fact it’s quite interesting. Also it’ll be good to have some pages in different colors to create visual interest and excitement with the help of contrasts.. Anyway, they did a great job to make their website look inviting and cozy, just like their cafés. Combonuvo.com – you may think that there’s no need for musicians to have their own website because nowadays you have a lot of opportunities to download any track you want from a music storage service. On the face of it, yes, it may seems so, but if you delve deeper, an artist’s website is a special venue which reflects the band’s personality, its music style, creates a special bond with the fans, and makes new tunes instantly available to people all around the globe. Combo Nuvo are enthusiastic and professional, so is their website, which finds a good balance between simplicity and valuable content. Each page of the site contains useful and relevant information presented in an easy to comprehensible way. 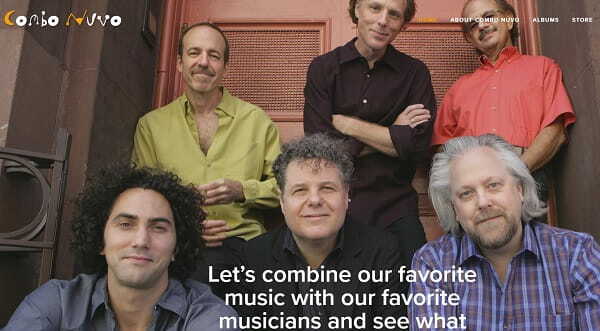 I especially loved the way they formatted the About Us page which features artists’ bio and photos. The band uses the built-in commerce tool to sell their music online which is available on CD as well as a digital download of albums and individual tracks. So basically they have a two-in-one website — a business card and an online shop. The only thing which is missing are social media. It’s hard to imagine a modern website without them, but it’s very easy to handle this issue. They also have a Blog page and a Media section where you can watch some videos with Combo Nuvo’s jazz. As far as the design goes, I can confidently tell that it’s so damn good that other bands should consider using it as an example. Neat and elegant, it suggests that the band produces feel-good music that is easy to listen to and fun. All in all, in every aspect it’s quite a marvellous website, which I find very exciting to explore. Laicale.com – another beautiful website that uses Squarespace’s eCommerce engine is Laicale, a NYC hair salon. What do you think about black color? No, it’s not depressing or melancholic. In fact, it’s stylish. That’s what you’ll think when you visit the Laicale website. Visit the website and see for yourself! The website features a rather professional design. Main colors are black & white, it’s a timeless classic which always works. Another good thing about the website is that it has a social media bar with handy and convenient buttons. The only thing I believe they should provide is a direct Contact form. With it on board, the website will be almost certainly one of the best in the field. Today, many companies and independent professionals take advantage of eCommerce to showcase and sell their products globally, and one of the easiest ways to get a webstore up and running is to use a site builder with eCommerce capabilities, like Squarespace. If you’d like to be the next featured Squarespace website, just leave a comment below!